DAVENPORT, Fla. - The head of a Davenport Home Owner’s Association may have some explaining to do to hundreds of residents. David Meadows is accused of stealing more than a half million dollars of the association’s money by issuing bogus fines and doing business with his own companies. The state attorney’s office launched an investigation after numerous complaints from residents. Deputies arrested Meadows on Tuesday. 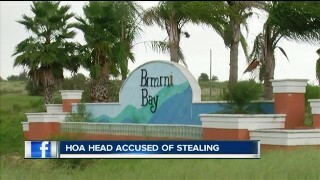 Groth has lived at Bimini Bay for about four years. In that time, she says she has witnessed the HOA issue 100 dollar a day fines from anything from cigarette butts on the ground, the wrong kind of blinds, to kids' toys left in the yard. “The way that they get you is that you move in and everything is supposed to be included and then you get overage fees every month,” she said. The state attorney’s office says Meadows used this scheme of defrauding residents to bring in more money not for the association, but for his own personal use. owns, including a water company. Until recently, that was the utility contracted with the association. 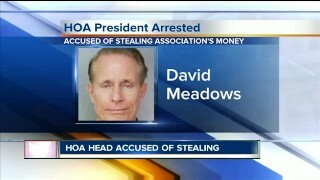 The state attorney’s office says since he was the HOA president and the board only consisted of he and his wife, Meadows easily made deals with his own companies. Part of the frustration is the dues that everyone pays are supposed to go towards maintaining the property, and she feels it’s not being maintained. Meadows has been charged with scheming to defraud, grand theft, money laundering, and a violation of the white collar crime protection act. He’s currently out on bond. Calls to the HOA office and Meadows' phone have not been returned.